It’s all Korean food today as I helped my mom with errands and got two meals in return. Today’s entry is going to be a list. 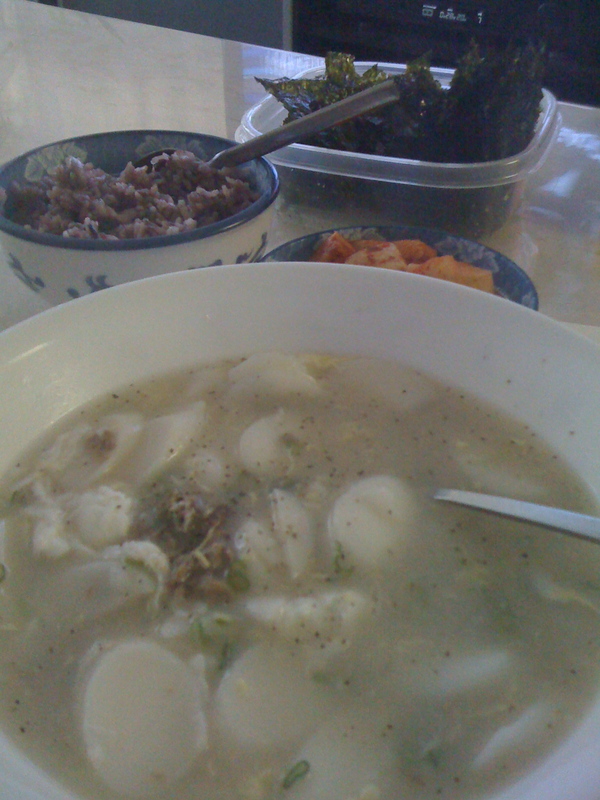 Dduk guk is a soup filled rice cakes. The soup stock is made from beef bones, and it contains scallions, salt and occasional slices of beef. “Purple” rice is cooked with Japanese Adzuki beans, which gives it a peculiar, nutty taste. It’s healthier than straight-up white rice. Kokdugi is kimchi made with turnips. Soondubu is a spicy stew of tofu. And a common Korean side dish is sang sun jun, bite-sized slices of cod dipped in egg batter and pan-fried.